Have you heard of Jaden Conwright? Maybe not – but after 20 months out of the sport, the young Californian racing driver bounced back in style in 2018, scoring one victory, two pole positions and five podium finishes in the inaugural Formula 3 Asian Championship. 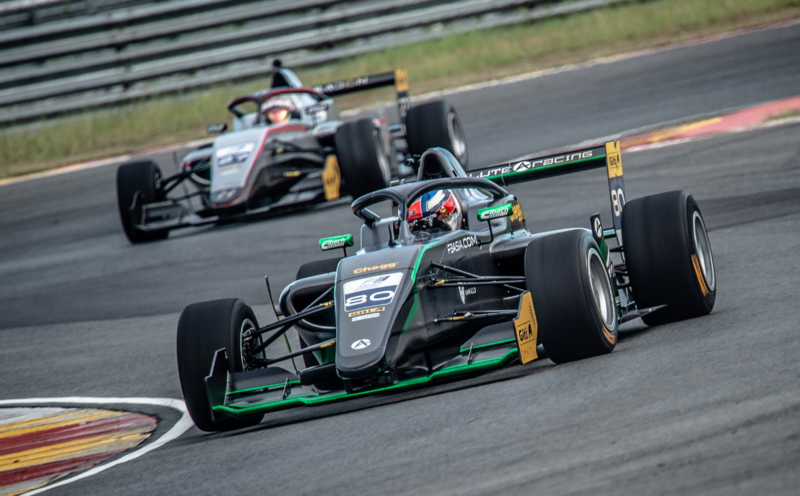 Prior to the start of the all-new series’ in Malaysia in mid-July, Conwright had not contested a race since the conclusion of the 2016 Italian F4 Championship a year and a half earlier – but he quickly settled back into the groove. Competing for Absolute Racing, the talented American teenager sped to a brace of top four finishes on his debut behind the wheel of his new 270bhp single-seater, and when battle resumed at Ningbo International Circuit in China for seconds-out, round two, Conwright sensationally stole the show. Twice claiming the top spot on the starting grid over the three-race weekend, the young Californian went on to convert that stellar pace into his breakthrough triumph in Asian F3 as he beat ex-BRDC British F3 front-runner Ben Hingeley and GP3 Series race-winner Raoul Hyman to the top step of the rostrum – in so doing becoming the first driver to crack the early-season Dragon Hitech GP hegemony. Further podiums would follow in Shanghai and in changeable conditions in the finale last month back at Sepang – where he twice outperformed 2017 Euroformula Open Champion Harrison Scott – making Conwright one of only a handful of competitors to register a top three result at every track on the calendar. His impressive consistency – missing the top six just twice in 15 starts – secured the 19-year-old Fremont, San Francisco Bay Area-born ace an excellent third place in the overall championship standings amongst the 26 entrants, behind only Hyman and fellow GP3 Series race-winner Jake Hughes. That put him ahead of the likes of 2017 Asian Formula Renault and Chinese Formula 4 Champion Charles Leong and his own Absolute Racing team-mate Akash Nandy, a man with significant international experience under his belt. With his eye-catching results deservedly earning Conwright points towards an FIA Super Licence, the former World Speed Motorsports Rising Star Award-winner and Carlin Academy member has been left to reflect upon a supremely successful return to the fray. “It’s definitely been a good season,” he acknowledged. “For somebody who lives and breathes racing like I do, taking a year out to test in 2017 was not easy, but it was the right decision and the prospect of rejoining the grid in 2018 kept my motivation levels high. More importantly still, I made sure to apply everything I learned last year to come back stronger than ever, and to achieve the results that we did was extremely satisfying. “Racing and testing require two completely different mindsets, and whilst my lap times were pretty good right from the outset, it took slightly longer to fully blow the cobwebs away in race situations, where I was a little bit rustier and had to re-adapt to things like standing starts and wheel-to-wheel battles – but I made consistent progress in terms of my driving and mental approach throughout. “Ningbo was obviously a very special weekend, and definitely the highlight of the season for me. We arrived there very well-prepared, and to stand on the top step of the podium in an international, FIA-sanctioned series was an incredible feeling, fully justifying all the work we had put in over the previous year-and-a-half. “The following round in Shanghai then taught me an important lesson about how to stay focussed and make the most of an imperfect scenario when things aren’t necessarily going your way. We were really on the back foot there in the dry, so to keep fighting and digging deep and end up on the podium in the final race of the weekend I think showed a lot of resilience and inner strength. “I have to say, working with Absolute Racing was a total pleasure. It’s a real family environment and I honestly couldn’t have asked for a more supportive or capable group of guys behind me, and to be able to measure myself against such a high calibre of rivals in Asian F3 was very positive for my own career development. Conwright’s manager at Williams-Harfield Sports Group, Giacomo Sgarbossa, was effusive in his praise for the form displayed in recent months by his highly-rated protégé – and he is convinced that his impressive results in Asian F3 are only the start. “I’ve thoroughly enjoyed working with Jaden and Absolute Racing this year and am so proud of the progress he has made,” Sgarbossa said. “Third place in the championship is the reward they both deserve for all the hard work they put into the programme. When we saw that Hitech GP was coming to Asia, we knew they would bring a high level of competition and they did exactly that. I think that was great for the series and I am thrilled to have watched Jaden battle with them throughout. “Before the season began, there was a bit of uncertainty surrounding Jaden’s racecraft as he’d been away from racing conditions for quite some time but by round two, he was already on the top step of the podium. He led the Absolute Racing charge and was one of just three drivers to score a pole position. We also shouldn’t forget that Jaden was one of the youngest guys on the grid and was competing against GP3 race-winners amongst others. Jaden Conwright wears a Stilo ST4 FN 8860 helmet, which is currently for SALE with 50% OFF at Nicky Grist Motorsports.